Have a question on Grand Cherokee? Grand Cherokee is available in 6 different colors - Velvet Red, Bright White, True Blue Pearl, Brilliant Black Crystal Pearl, Billet Silver and Granite Crystal. Watch latest video reviews of Jeep Grand Cherokee to know about its interiors, exteriors, performance, mileage and more. 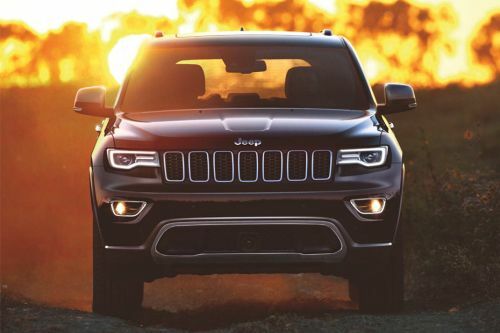 The gigantic American automobile brand, Jeep looks more big with its new successor christened as the Jeep Grand Cherokee. The car is a mid-size SUV manufactured by the American manufacturer Chrysler and is based on a unibody chassis. The SUV was first launched in 1992 as a 1993 model year vehicle in the luxury SUV segment and is presently running in its fourth-generation since 2011. Grand Cherokee equipped with luxurious interiors and a classic Jeep styling was showcased at the North American International Auto Show at Cobo Center. The SUV is given a rugged yet sophisticated exterior designing with a hint of sportiness with the muscular expressive lines flowing on the bonnet and the side body. The new LED integrated HID head lamps and the fully chromed radiator grille fetches elegance to the exterior design of the car. Coming over to the heart of the car, the SUV is available in 4-variants - the Laredo variant, Limited variant, Overland variant and the Summit variant, which is powered by either of the two engine variants- 3.6 litre Pentastar V6 engine and the 5.7 litre V8 engine. The powerful 5.7 litre V8 engine churns out a maximum power of 360 hp at 5150 rpm and a colossal torque of 520 Nm at 4250 rpm. Adjusting yourself in the interiors is never a issue with the spacious interiors of Jeep Grand Cherokee, which pours luxurious amount of convenience and comfort in your glasses. The driver can feel the right pleasure of each ride owing to the solemnly intuitive driving controls with the 7-inch multiview display with leading-edge TFT technology, 8.4 inch touchscreen featuring the intuitive Uconnect system and the leather-wrapped multifunctional power steering. The car also features an extensive list of fully-functional safety features, which include the Antilock Braking System, Electronic Brake-force Distribution, Electronic Stability Control, all-speed traction control, Selec-Terrain system, Adaptive Cruise control and Cross Path Detection, hill start assist, Trailer Sway control, Electronic Roll Mitigation and front,side and curtain airbags. Melt into the pleasurable interior ambiance featured by the car. Owing to the precisely and ergonomically crafted driver's cabin with features like the personalized instrument cluster comprising of the customer-configurable 7-inch multiview display with leading-edge TFT technology, a full-speed gauge, navigation system, Selec-Terrain system and Quadra-Lift system the driver gets his perfect feast of enjoyment with each ride. The 8.4 inch touchscreen featuring the intuitive Uconnect system, adaptive cruise control, electrically adjustable driver's seat and the leather wrapped 3-spoke multifunctional steering wheel adds some more spices to the driver's feast of joy. The captivating comfort incorporated in the interiors of the car is worth a lot of praise. The large leather-trimmed seats with detailed stitching and heated and ventilated 1st row and heated 2nd-row seats have their own gravity zone which bounds you to relax in them. The other attributes describing the comfort of the car are Harmon Kardon audio system, infrared dual-zone automatic temperature control and the command-view dual-pane sunroof. The desirable ambience added by the soothing interior lighting, convenient storage compartments and the decorative wooden trim running all around the interiors is worth experiencing. Talking about the space the cabins provide their occupants for their head and leg movements and for carrying their useful amenities is quiet luxurious. The car manages to buy you a huge cargo volume of 990 litres, which can be extended to 1950 litres. The interior cabins are well-fed with technology, which also adds to your entertainment and convenience with the well-configured list of stereo and accessories. The car is equipped with a standard superior quality Harmon Kardon 825-watt Premium Audio System with 19 speakers, including a subwoofer that lets you taste the real essence of your favorite genres. The two 9-inch screens mounted on the seatbacks, capable of playing both DVDs and Blu-ray Discs and having separate ports for plugging in video games or other devices adds to the rear entertainment of the car. Strength is mentioned in each detail of the exterior design of Jeep Grand Cherokee. The exterior design of the car is at the same time made to look stylish, so as to go with the trend. The fully chromed signature 7-slot radiator grille, the exclusive new adaptive LED integrated HID (High Intensity Discharge) headlamps, having the ability to swivel in response to steering wheel movements and the projector fog lamps displays innovation and stylishness in the front appearance of the car. The other features like the robust and wide front bumper design and new sporty rear fascia along with the stylish rear lamps adds a sophisticated ruggedness to the exteriors of the car. The other eye-catching feature added to the car is the spectacular 20” and 18” wheel design options with each design displaying its own uniqueness. The exterior dimensions of the Grand Cherokee that describes its grandness reads an overall length of 4828 mm, a width of 1943 mm and a height of 1802 mm. The wheelbase of the car measures 2915 mm which makes this SUV quite spacious inside. The 20-inch polished wheels with Mineral Gray pockets, which along with providing a dependable and desirable drive adds to the aesthetic value of the car. The superior grip tyres mounted on the wheels are printed with the dimensions according to the wheel design chosen. Pumped-up by the 5.7 litres V8 engine with a Fuel Saving Technology implanted in the engine costs you a litre of fuel for every 9 km of highway roads. Which is quiet impressive with the available dynamic power and acceleration values. Grand Cherokee is available with 4-variants namely- the Laredo variant, Limited variant, Overland variant, Summit variant. The car is poured-in life by two engine options – 3.6 litre Pentastar V6 engine and the 5.7 litre V8 engine. The 5.7 litre V8 engine satisfies your dynamic desires by gifting you a peak power output of 360 hp at 5150 rpm and peak torque of 520 Nm at 4250 rpm. This powerful engine is incorporated with a 8-speed automatic transmission which utilizes the power efficiently and allows the car to establish a speed of 100 kmph from a stand-still in just 6.6 sec. Owing to its Fuel Saving Technology the engines extracts each unit of energy from the fuel to give you a fuel economy of 9 kmpl for highways. The four available variants of the desirable SUV are fitted with either of the two engine options namely - 3.6 litre Pentastar V6 engine and the 5.7 litre V8 engine. The 3.6 litre Pentastar pours out a maximum power of 290 hp at 6400 rpm and a torque of 353 Nm at 4800 rpm while the 5.7 litre V8 engine satisfies your dynamic desires by gifting you a peak power output of 360 hp at 5150 rpm and peak torque of 520 Nm at 4250 rpm. The ferocious 5.7 litre V8 engine chained with a 8-speed butter-smooth transmission utilizes the power efficiently and allows your SUV to dispatch a speed of 100 kmph from a stand-still in just 6.6 seconds . The dynamism featured by the car needs to be controlled efficiently, this purpose is served by the efficient braking and handling assists added to the car. The powerful SUV is installed with a braking system consisting of vented disc brakes on the front wheels and solid discs on the rear wheels assisted by Antilock Braking System and Electronic Brake-force Distribution. The car body is supported on a front short/long arm (SLA) suspension and multilink rear suspension and is fitted with handling assists like Electronic Stability Control, Selec-Terrain control, adaptive cruise control and Trailer Sway control. The car body pampers and cocoons its passengers with a caring envelop of dependable and functional safety features. Starting from the braking assist added by the Antilock Braking System and Electronic Brake-force Distribution to the stability assist added by the Electronic Stability Control, all-speed traction control, Selec-Terrain system, Adaptive Cruise control and Cross Path Detection, hill start assist, Trailer Sway control and Electronic Roll Mitigation. The car is poured in with more safety by the advanced multistage driver and front-passenger airbags, side and curtain airbags, parking assists and forward collision warning. What are the colors options available in Jeep Grand Cherokee?